Lets face it, Google is helpful. I sometimes ponder about life before Google, about those arguments with friends that used to last days or those pub quizzes where only the geography buff knew the capital of Indonesia. Google is something familiar, a way of life (of sorts) and having great search skills can really open you up to a universe of useful and useless information. Here are some things you might not have known Google can do. Did you know there is a hidden game inside Google called “ZERG RUSH”? Search Zerg rush in Google to start a hidden game, quickly click the incoming 0’s to kill them before they destroy your search results. Google will also tell you what time sunrise is at! So there you have it, some things to explore in your next searches. Remember, there is a universe of information out there and your search engine is your vehicle. Learning how to correctly search and developing your search skills will greatly increase your chances of finding the information you want. In my travels around the internet I came upon a very interesting list of six core competencies that Microsoft look for in prospective employees. These are general competencies that could really be applied to any prospective position. As a Jobseeker It is useful to get a little insight in to the competencies that companies look for when searching for new employees, and this can help you prepare better for interviews. Adaptability – Demonstrates curiosity and actively explores options. Responds efficiently to changing demands and circumstances. Functions effectively in ambiguous situations. Maintains a constructive attitude in times of stress. Collaboration – Drives alignment and teamwork within a team, department, or across organizational boundaries. Combines resources and joins efforts to achieve company-wide goals. Drive for Results – Tenaciously pursues positive outcomes by using effective approaches to solve problems. Delivers on commitments and seeks increasingly challenging work. Takes responsibility and holds others accountable for actions, decisions, and goals. Influencing for Impact – Communicates and networks effectively. Successfully persuades and influences others. Judgment – Effectively scopes problems. Builds and applies a job-relevant knowledge base. Makes decisions with conviction. 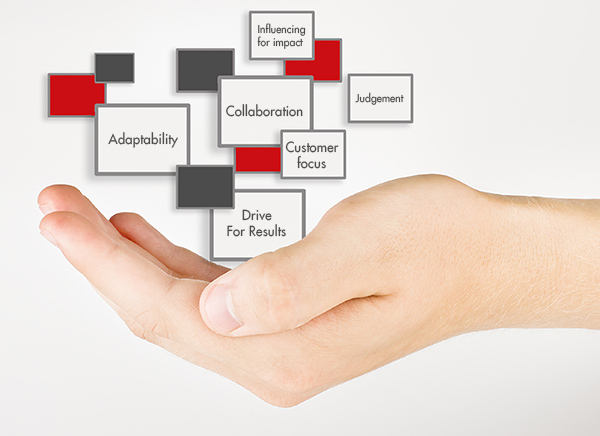 Customer Focus – Anticipates customer needs, and proactively meets and exceeds customer expectations. Recognizes the issues that customers want to resolve, and creates, or facilitates the creation of, products and services to address customer needs.